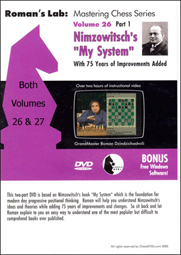 As indicated by the DVD cover, “this two-part DVD is based on Nimzowitsch’s book ‘My System’ which is the foundation for modern day progressive positional thinking. Roman will help you understand Nimzowitsch’s ideas and theories while adding 75 years of improvements and changes. So sit back and let Roman explain to you an easy way to understand one of the most popular but difficult to comprehend books ever published.” The DVD plays on your TV (or DVD drive). Dzindzi makes his only on camera appearance in the introduction, where he relates how we still utilize the principles of play outlined by Nimzowitsch. He states, “We still use these principles, but we made some adjustments. I would normally – I normally, not me, just any reasonably strong chess player uses those principles. But what they do, they also, they modifying it. And I’m going to show you, since Nimzowitsch, just how this modifying works and why it’s – we have different criterias where we get – we don’t have different criterias, we just are more flexible. We’re using his ideas in more improved version and these DVDs will explain you, will take you throughout all this evolution of Nimzowitsch’s ideas.” Whether this makes for “an easy way to understand” the material is questionable. The running time of this DVD is two hours and one minute, which gives occasion for the publisher to promote it as “over two hours of instructional video.” However, if it clocked in at closer to three hours, one would feel that they got their money’s worth to a greater degree. Advanced School – Tutorials on chess fundamentals. Blitzin 2.31 – An interface to play chess online with the Internet Chess Club. Bookup 2000 Express – A way to learn chess openings. Chess Mentor – Instructional software. ChessReader – Software that displays ChessCafe.com eBooks (which are no longer available – MD). Chess Tactic Arts – Tactical training. Master Chess 3000 LE – A fully functional chess playing program with a searchable database of over 100,000 games, which also imports & exports games in PGN format. Dzindzi may not be the most articulate presenter, but he is a colorful personality, and you have to accept this in order to enjoy his DVDs. Dzindzi does not really explain Nimzowitsch’s ideas and theories, but rather takes a fresh look at some of the same positions, often with informative results. This is certainly not the way to learn about Nimzowitsch’s concepts, but there is something to be said for having a 2700 GM demonstrate a number of positions in the quiet of your living room.